It’s an ornament… It’s a box…. It’s just cool! Home / It’s an ornament… It’s a box…. It’s just cool! Okay, so the question is what else can you do with an ornament sized odd shaped canvas other than make it into another ornament? What if you want to enjoy it year round? Well, you can applique it to just about anything. Jeans, jackets, purses, totes. 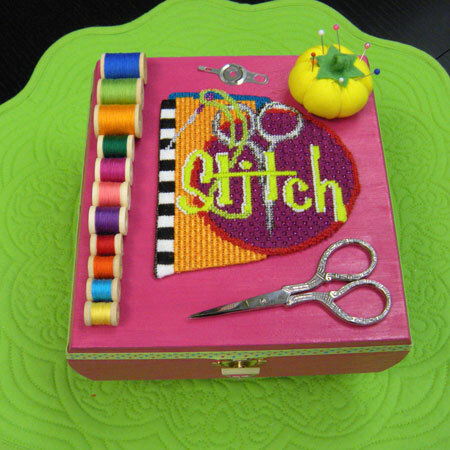 Why not take it a step further and applique it to a box top. That’s exactly what we did. One of my dearest customers called me and said, she had finished stitching my “Stitch Ornament” but she didn’t know what she wanted to do with it. She didn’t want it to be an ornament. She wanted a box. She had antique thread spools from a friend of hers and they were to be the feet. That’s where we started. Creativity took us the rest of the way. Here’s the results. I hope you enjoy it as much as we are. I am dying to know. Are the scissors removable? A magnet under the lid might be a fabulous way to hold our scissors in readiness and also use them as a decoration….